With the holidays rapidly approaching, it means you have to run out and buy buy buy! Just kidding. While we are making strides towards minimalism in our house, I get excited to buy presents I know others will adore (and I never mind receiving a kitchen tool or two myself). It makes me giddy to give someone my favorite kitchen gadget or tool and go on and on and on about how exceptional this (insert kitchen tool here) is. I teach cooking classes and one of my favorite things to do is share my favorite kitchen equipment with my students. My enthusiasm is genuine. I am a total cooking gadget NERD. So, in the spirit of totally nerding out over kitchen gadgets, equipment and such this Christmas, I’ll share my favorites with you in the hopes I can spread the Christmas nerd cheer. Disclosure: This post contains Amazon affiliate links that earn me a small commission, at no additional cost to you. I only recommend products I personally use and love or think my readers will find useful. 1. The OXO bench scraper is indispensable if you are a baker. This scraper will easily cut and portion dough. The scraper quickly scrapes all loose flour into a pile and into the garbage for easy cleanup. It also includes quarter inch marks on it for easy measuring. 2. This thermometer is quick and easy to use to temp bread, meat, and even reads hot enough to use for candy making. There is a hole in the sheath to extend the handle outward (which always awes my cooking class students for some reason). 3. This citrus press takes a lemon or lime, turns it inside out, and completely depletes it of any liquid it contains. If you want to get every last drop out of your citrus fruits, get one of these babies! 4. These mini whisks are good for whisking up a quick salad dressing, a single serving of scrambled eggs or a sauce for your favorite stir fry. I have two of these and I use both of them every single day. Plus, they’re so tiny and cute, they’re just fun to look at (nerd alert). 5. These kitchen timers are my favorite because they are loud and I can hear them anywhere in the house. They also count down and reset themselves to the number you set them at before, so you never have to try and remember how long you had those potatoes roasting in the oven. 6. I won this OXO cookie spatula in a drawing 7 years ago and have used it daily ever since. It is called a cookie spatula, but the main thing I use it for is flipping pancakes and fried eggs. It is the perfect size for both of these tasks, since the larger spatulas are often too big and clumsy. 7. The Microplane grater is great for zesting citrus, finely grating garlic and freshly grated nutmeg. This is a great way to bring out flavor in your dishes because it finely grates everything and distributes ingredients more evenly throughout the food. 1. My Vitamix is hands down my favorite kitchen appliance. I use my Vitamix Blender on a daily basis for making smoothies, vegan cheeses and sauces. I am fairly certain I would be lost in my kitchen without it. My refurbished Vitamix was purchased five years ago and it is still working just fine after daily use. Buying a refurbished Vitamix is less than a brand new one and, from my experience, a great way to save money on this great product. 2. My next favorite kitchen appliance is my Cuisinart food processor. Yes, a blender can do many of the same things a food processor does, but not everything. For instance, I can quickly shred or thinly slice vegetables with different blades which is not an option with a blender. You can also roughly chop vegetables and make pie and pasta dough. This is a must for any kitchen. I use my food processor to make Chickpea Salad, a quick and easy staple in my home. 3. I love my KitchenAid Mixer and use it often for mixing up cookies, whipping coconut cream and kneading dough. They do take up a fair bit of counter space, but the handiness of it makes the real estate it uses worth it. 4. A cast iron skillet is essential in any healthy kitchen. Cast iron is a safe non-stick option when cooking and is also oven safe. Furthermore, did you know that cast iron has health benefits? When you cook in cast iron the food absorbs some of the iron, which is a great way to add iron to your diet. I have a tendency towards anemia and this is a great way to add a little more iron to my diet. 5. Mesh Strainers are multi-purpose and I like having several sizes. I use the bigger ones for pasta and the smaller ones for cans of beans or olives. I also like to use the really small ones for sprinkling brown sugar or cinnamon on top of baked goods. Also, if you love poached eggs, break an egg into one of these before you put it in the water and let the watery part of the white drain off. You’ll have the perfect poached egg. 6. Salad Spinners are a great way to get your freshly washed greens and herbs washed, dried and ready to eat in no time. 7. A Tapered Rolling Pin is my rolling pin of choice because of it’s sleek design and low maintenance. I’ve used this type of rolling pin for years and feel it’s easier to handle. This kind of pin doesn’t leave indents in your dough because there are no edges. There are also no bearings to maintain and no chance of it falling apart on you. It’s just one solid, beautiful piece of wood. 8. An Immersion Blender is essential for making pureed soups and sauces. While the Vitamix could also be used for this, you run the risk of burning yourself or making a huge mess when pouring your hot soup from the pot to the blender. An immersion blender beautifully purees your soup without the extra hassle. Plus, they’re easy to cleanup and take up only a small amount of storage space. 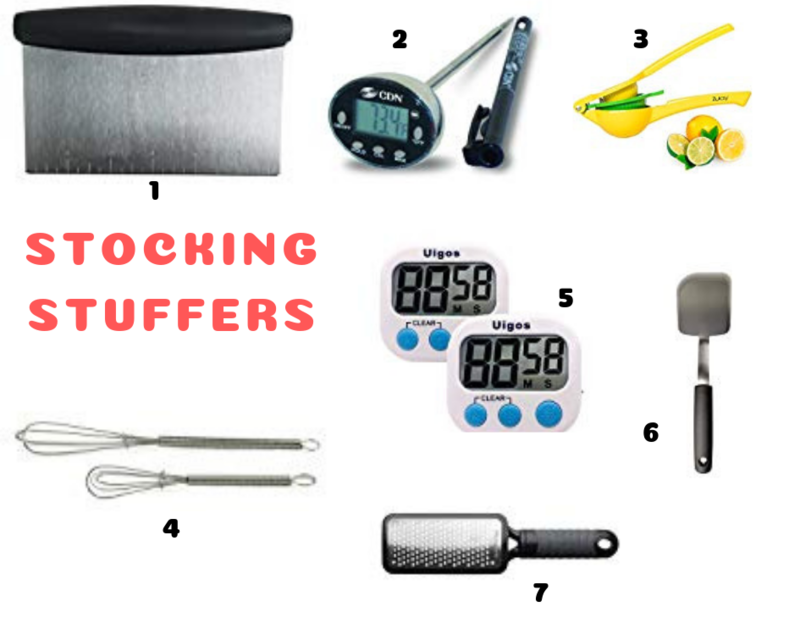 This is just a short list of my favorite kitchen tools and appliances. 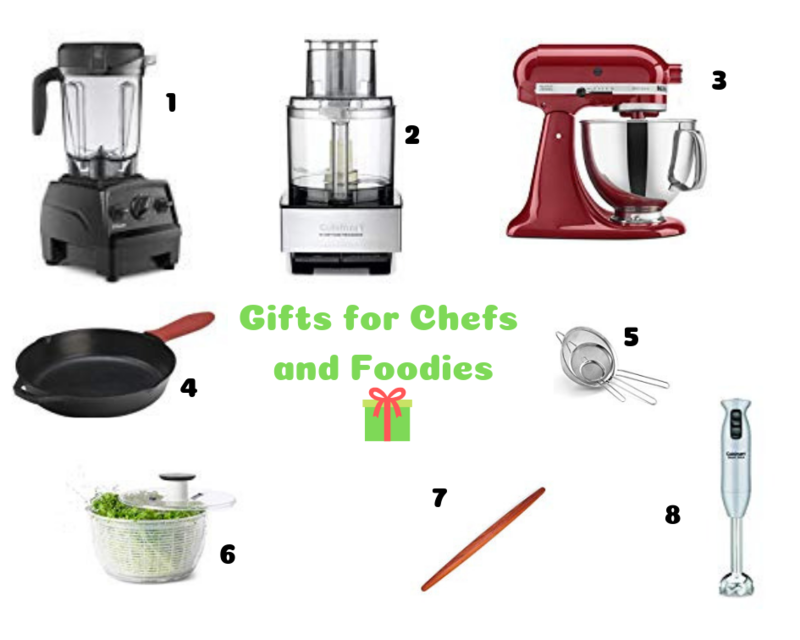 I hope this gift guide for chefs and foodies gives you a few ideas for the people on your holiday shopping list! Happy Holidays! !